Master Thief Lupin III, a.k.a. "The Wolf," and his right-hand gunman Jigen are hot on the trail of a double-crossing counterfeiter. But when their search leads them to the secluded European country of Cagliostro, they find far more than they bargained for. 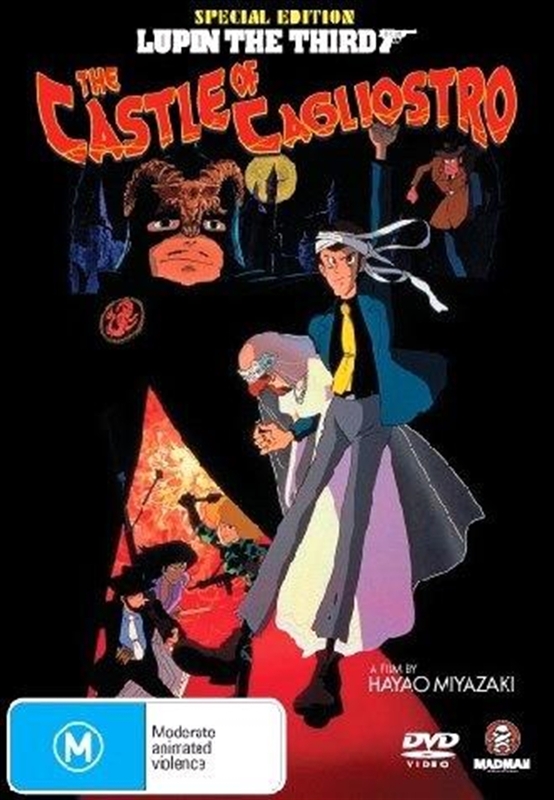 Lupin unwittingly attracts the attention of the nation's mysterious monarch when he tries to help a damsel in distress escape the Count's henchmen, and in the process stumbles upon the key to finding the lost fortune of the Cagliostro clan. With the help of the beautiful Fujiko, the Stoic Swordsman Goemon and the bumbling Interpol investigator Zanigata, Lupin undetakes to penetrate the defenses of the Count's fortress, rescue the girl, break-up a counterfeiting scheme, and escape with the hidden treasure of the Castle of Cagliostro.Written and directed by anime producer and visionary Hayao Miyazaki (Princess Mononoke, Kiki's Delivery Service) anime fans will enjoy this lighthearted romp which Steven Spielberg once called "one of the greatest adventure movies of all time."